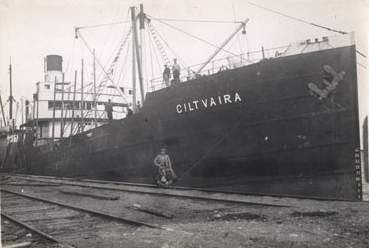 Ciltvaira SS was completed in March 1905 as British Endsleigh for Endsleigh SS Co Ltd (Bellamy & Co), Plymouth. 1907 sold to Belgium and renamed Président Bunge for Cie Royale Belgo-Argentine (Armement Deppe), Antwerp. 1924 sold to Britain and renamed Twyford for Britain SS Co Ltd (Watts, Watts & Co Ltd), London. 1932 sold to Estonia and renamed Vironia for N.C. Pihlakas, Tallinn. 1935 sold to Lat via and renamed Ciltvaira. When Latvia was annexed by the Soviet Union in 1940, she was one of eight ships that did not follow the orders to return home and continued to sail under the Latvian flag. U-boats sank five of these eight ships and damaged a sixth while another one was sunk by an Italian submarine.